Looking through these images, Do you remember your childhood? Game Shoot Matryoshka will once again take you back to the memories of those Russian dolls lovely day. 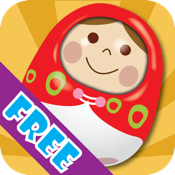 With this type of game shot favorite things, Shoot matryoshka will experience the best in each game screen, The dolls are arranged in a very special location on the screen, requires you to have accurate shooting skills, You have to be very clever to shoot baby dolls to great dolls to complete the game. Let's explore and have fun together with your day, Be revived feelings in the morning and your foolish with Shoot Matryoshka.